There's nothing more emblematic of the Holiday seasons than the cozy feeling you get waking to a fire and conifer brimming under with presents. That feeling of togetherness and warmth and holiday spirit shared while singing songs of the season with friends and family. That feeling of having all your favorite xmas party games all in one place. Ah, such good times! 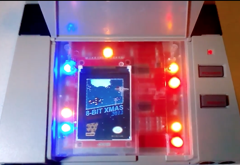 This years xmas cart is a multicart that contains all NINE previous years 8 BIT XMAS carts in one! From 2008 to 2016, all 8 BIT XMASes are in their original version, complete with original title scenes, xmas music, and of course the games!! As well as being a multicart, this cart also contains a LCD screen in place of the label. The screen changes depending on what game you select!! See video here. To pick a different game, just hold select for a few seconds to return to the game selection screen. Playing in a top loading NES? No problem, the cart is smart enough to know what console its in and the screen will be displayed right side up! 2014 - Killer Queen Arcade, up to 6 players(uses 2 power pads) can play at once! 2016 - Xmas Pinball, its pinball! Pick your game... See label change on LCD! Works on HDMI systems like the AVS.